Troy Helmet Large - this item is being discontinued, priced to sell!! Troy Helmet Medium - this item is being discontinued, priced to sell!! This Helmet is by far one of the most superior Trojan style helmets that we have to offer. The styling is great, the finish cannot be beat and it is completely lined on the inside. This helmet is available in a new type of Dark Metal finish, this gives the helmet a rugged, textured look, like it has been around for ages. The dark metal also protects against rust and is very durable, thats right, it will not rust or scratch upon contact with another metal. Our Troy Steel Helmet is completely padded and lined on the inside, there is no need for an arming cap. This helmet also has a adjustable chin strap. The padding cosists of thick strips of foam, if you need to make the helmet bigger, you just take out some of the strips. If you need to make the helmet smaller, than simply add insert them in the leather liner. Very simple and extremely comfortable. This method gives you the perfect fit and prevents the helmet from sliding around. 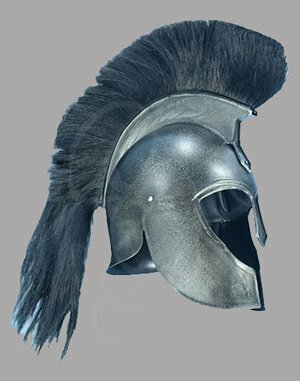 The helmet has an attached black plume.